You Are Here: Home » SEO » Sitelinks on Google: How do You Get Sitelinks? Question. I am stumped by sitelinks! Have read Outsmarting Google and various other books but none mention how to get google to find sitelinks. Am no expert, but there MUST be ways of directing google to find what you want them to find? My website is based on a Joomla template – we have meta page titles, meta descriptions… is there something else I should be doing in order to have sitelinks? Thanks in advance for any help! All of those tips and tricks “signal” to Google what your site is about; your primary pages. Then, it will pick them up. Next, you log into Webmaster tools. On the left-hand side, click “search appearance,” “sitelinks.” You can then DEMOTE the ones that it is picking up that you DO NOT like. Over time, therefore, you “train” Google as to what sitelinks you want to appear. 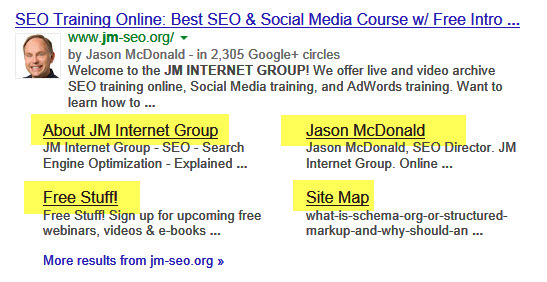 Hope this helps, and hope you can join us in our SEO training online classes at http://www.jm-seo.org/.